Inserting call-to-action buttons can improve lead generation. Landing pages are used to move visitors into a specific sales funnel based on their needs. Are you getting leads from your real estate website? According to the National Association of Realtors Annual Profile of Buyers & Sellers, only 4 percent of sellers found their agent through the agent’s website. That could be due to a variety of reasons, from poor search engine optimization (SEO), which enables the agent’s website to be found on sites such as Google and Bing, to a lack of helpful information that enables homeowners to find what they’re looking for. In many cases, it’s because agents have been taught to focus on outbound marketing tactics, such as cold calling and direct mail, and they only use their website as an online brochure. Agents know they need a website, but very few know how to optimize their site for lead generation. Your website is an integrated group of web pages that tell the story of you and your business, covering a variety of subjects. As a real estate agent, your website plays a different role than a landing page. Your homepage is like the front door of a boutique. The goal of the homepage is to get people to come in and look around; you want visitors to explore your site for information. Whether it be for sellers or buyers, you want people to use your site to search for homes and learn about you. To do this, your site needs to instantly and attractively communicate your value proposition — what do you do, for whom do you do it, and what makes you the best agent for the job? A landing page is a single web page designed to provide information on one specific subject. It can be integrated with your website, or it can be a standalone page. Highly focused, there are no additional pages to detract from the primary goal of the page — to convert visitors to leads. While websites are used to inform visitors about you and your services, landing pages are used to move visitors into a specific sales funnel based on their needs, and then nurture those leads until they are ready to buy or sell. If you rely solely on your website to provide the information visitors are seeking without providing call-to-actions for additional content, you could be missing out on an opportunity to convert visitors to leads. Here is an example of a clean, well-designed homepage. This one is from Zoho, the developer of a cloud-based suite of tools made to run a business. In this example, we can clearly see the company’s value proposition: Zoho offers everything a business needs to boost sales, increase productivity and manage its daily activities. It is clear who they are targeting — anyone who runs a business and wants a suite of tools to make their business more efficient and profitable. We see that the company offers a free trial in exchange for providing your email address. At this point, you might assume that this is a landing page because they are attempting to convert visitors to customers by offering a free trial. That assumption is only partially true. While you should take every opportunity to convert visitors to leads, there are several important distinctions between this website’s homepage and a landing page. In this example, the website has colorful graphics that link to other pages, enabling visitors to learn about featured apps. Visitors have the option to view other pages rather than taking advantage of the offer to sign up. If visitors decide to register for a free trail, clicking the red button will take them to a landing page that serves as an integral part of the website. Once on the landing page, the only options available are to complete a registration form or leave the page. The text used on the landing page must present a compelling reason for visitors to complete the form. Having call-to-action buttons that link to landing pages where visitors can obtain more information is one way to generate leads by leveraging your website traffic. One of the differences between your website and a landing page is the way traffic is driven. Your website gets traffic through a variety of sources, including organic searches, particular keywords that your website ranks for, or through direct traffic where visitors have the URL of your website and access it directly. Landing pages can benefit from traffic to your website if they are integrated. You can also drive traffic to your landing pages through paid media, but you generally would not pay for ads to drive traffic to your homepage. 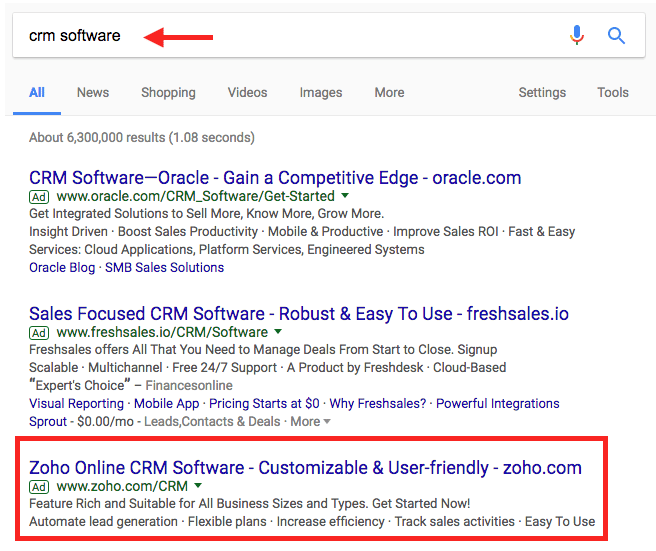 Zoho is using Adwords to create an ad that appears above the organic search results, as shown below. 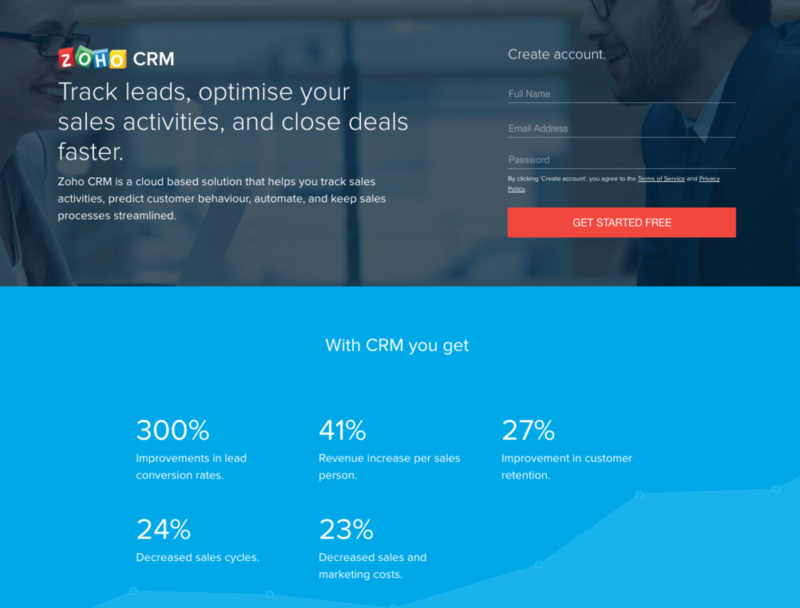 By clicking on the ad, visitors are taken to the landing page (shown below), which promotes the company’s CRM software. Once again, the value proposition for this particular landing page is very clear: track leads, optimize your sales activities and close deals faster. There is a subhead that provides additional benefits and graphics below that clearly define even more benefits. As you can see, there are no other links. This is because, unlike a website with information on a multitude of services or products, a landing page is designed to offer information on a single, highly focused topic: Zoho’s CRM solution. Visitors who are interested in purchasing CRM software have two options: register for the free trial or leave the page. 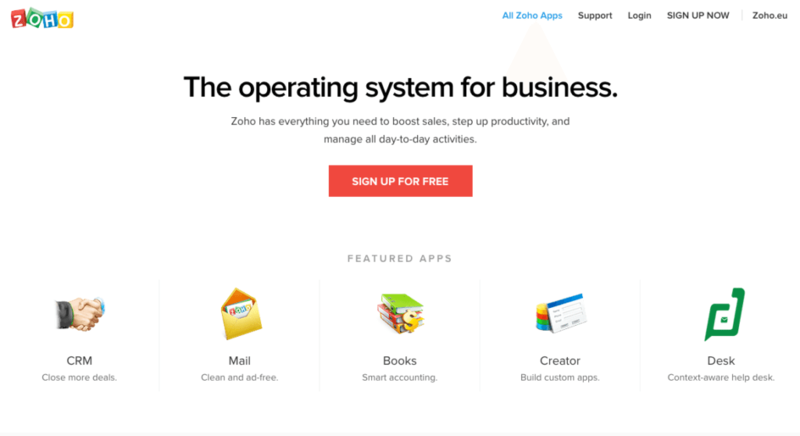 This landing page accomplishes the same goal as the call-to-action on the homepage of the Zoho site — encouraging visitors to sign up for a free trial — yet it focuses on the specific need for a CRM solution instead of promoting every app the company offers. Both types of landing pages — the standalone ones and those linked directly from the website — perform the same role with only one key difference: the landing pages that link from the various web pages take advantage of direct or organic traffic whereas standalone landing pages rely on paid traffic. As a real estate agent, you can leverage landing pages the same way Zoho does — by inserting call-to-action buttons into your website where you offer additional, specialized information in exchange for the visitors contact information. Or, you can utilize standalone landing pages and promote them with paid ads. You’ll continue generating more leads as you get better at understanding the unique wants and needs of your target audience. Landing pages rich with helpful, informative content are the key to effective lead generation. Greg Lyles is a real estate coach and trainer in Atlanta with 30 years of experience in real estate. He is the owner of a regional development company and a boutique brokerage, where he sold over $440 million on his own by focusing on two niche markets. Connect with him on Facebook and LinkedIn.